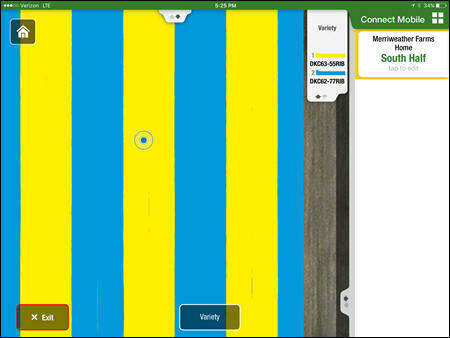 John Deere Connect Mobile is a mobile app that utilizes an Apple® iPad® tablet in the cab and helps the operator monitor job quality during planting, spraying, and harvest operations. 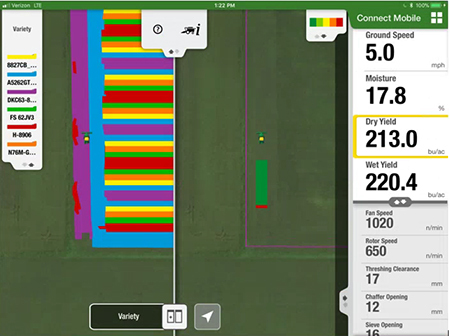 Connect Mobile documents and displays multiple quality layers, helping the operator monitor and more easily detect problems that can occur during planting, spraying, or harvest. 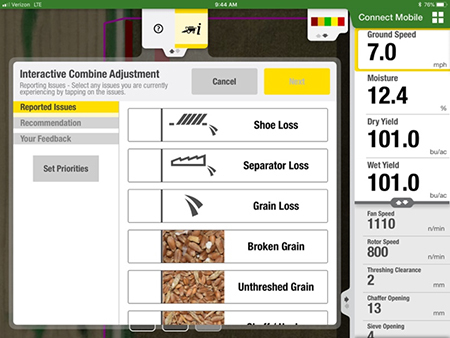 Connect Mobile also has a common user interface that makes it easy to use between different pieces of John Deere equipment. Apple and iPad are trademarks of Apple Inc.
Connect Mobile harvest makes ICA easier than ever to operate and monitor. ICA can assist operators in improving the overall daily and seasonal productivity of the combine. This feature is designed to resolve issues operators face during changing crop or harvest conditions and improve combine efficiency. NOTE: ICA is available only on Final Tier 4 (FT4) model year 2014 through 2017 S-Series Combines. 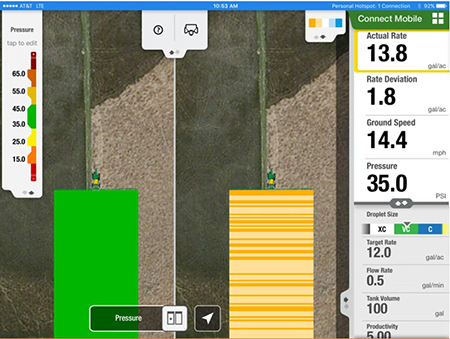 A user-flow wizard makes it easy to identify issues and adjust settings to optimize harvesting performance. 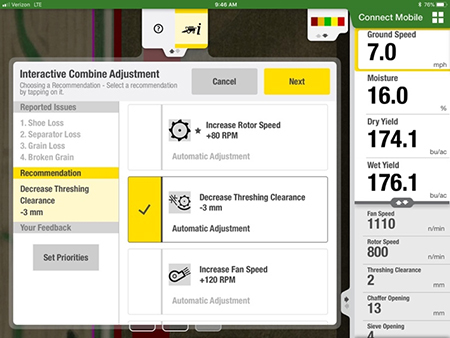 The operator can select from nine different conditions on the iPad® tablet screen to optimize combine adjustments based on field conditions. ICA recommends adjustments based on the priorities, current combine settings, and the issues reported by the operator. When a recommendation is selected, ICA automatically makes the adjustment. Some recommendations — like ground speed— also offer a manual adjustment option. The result is improved machine performance and grain quality. Connect Mobile harvest also has a run time monitor with key indicators. These include rotor speed, fan speed, threshing clearance, chaffer opening, sieve opening, average moisture, average wet yield, and average dry yield during harvest. They are displayed on the iPad for easy monitoring. When a combine adjustment is made, the operator can see the machine indicators that are affected as they change in real-time. Connect Mobile hardware is factory installed on all model year 2015 and newer planters with ExactEmerge™ row-units and all model year 2017 and newer planters factory installed with MaxEmerge™ 5e row-units, making it easy to get started with Connect Mobile. Ask a dealer for more information about retrofit kits. Connect Mobile hardware is factory installed on all model year 2017 sprayers. In 2018 and newer sprayers, the 4600 CommandCenter™ Display eliminates the need for the wireless data server (WDS). 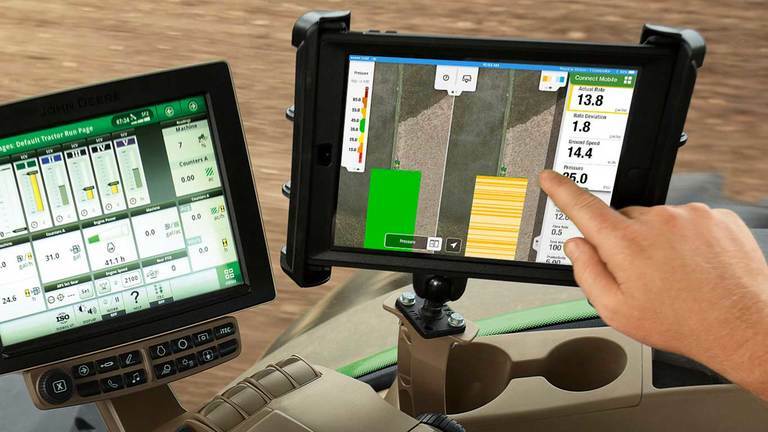 Producers can also retrofit Connect Mobile on older sprayers with a GreenStar™ 3 2630 Display by installing the sprayer field kit. Connect Mobile hardware was factory installed on all model year 2016-2018 S-Series Combines. In 2018 and newer combines, the 4600 CommandCenter Display and Modular Telematics Gateway (MTG) replace the need for a WDS, making it just as easy to get started with Connect Mobile. 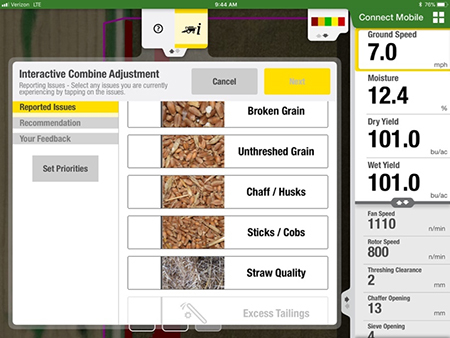 Producers can also retrofit Connect Mobile on older combines with a GreenStar 3 2630 Display by installing the combine field kit. The S700 Series Combines cannot utilize a WDS. Connect Mobile cannot be used if the GreenStar 3 2630 Display is installed as the Precision Ag display. 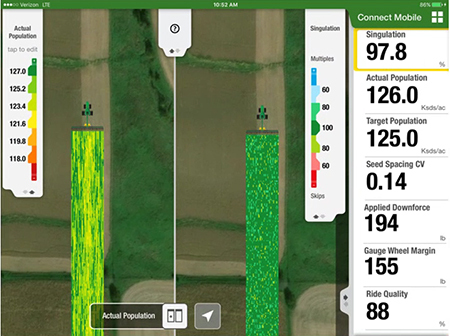 Learn more about Connect Mobile in the Field and Crop Solutions section within the Precision Ag Technology product line and how it can improve the quality of planting and spraying jobs. Connect Mobile is a solution that uses an Apple® iPad® tablet to help the operator better understand and manage the performance of their machines and implements. 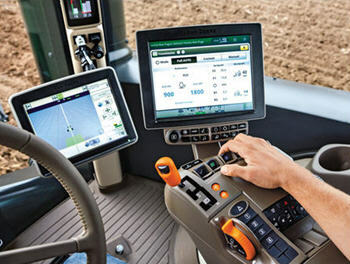 The iPad is utilized in the cab and works in conjunction with the GreenStar 3 2630 Display and 4600 CommandCenter Display. The Connect Mobile app augments the existing information available by displaying high-resolution, quality maps and performance metrics that are not offered by the GreenStar 3 2630 and 4600 CommandCenter displays. 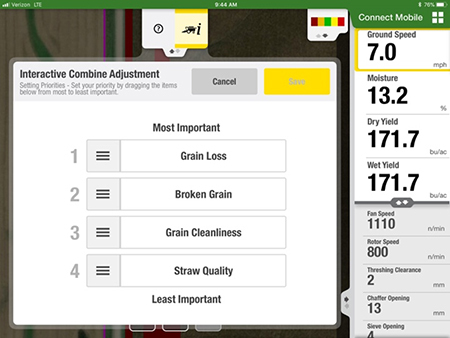 To simplify the use of Connect Mobile, the field selection, crop type, products, and other documentation setup data are configured in the GreenStar 3 2630 and 4600 CommandCenter displays and automatically sent to the iPad. Accuracy of the documentation data and the maps are also important with Connect Mobile. The global positioning system (GPS) information of the StarFire™ 3000 Receiver or StarFire 6000 Receiver is also sent to the iPad, improving the accuracy of maps and reducing the use of the cellular data plan and internal GPS position of the iPad. This ensures the documentation data being captured is accurate and displayed on the iPad properly. NOTE: The 4200 CommandCenter and 4240 Universal Displays are not compatible with Connect Mobile. The 4640 Universal Display is not compatible for harvesting but can be used with a wireless data server (WDS) for seeding and spraying. 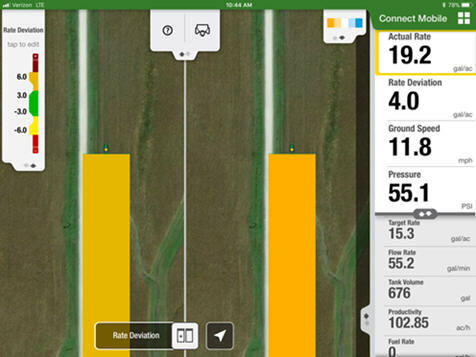 Field Review is a functionality that enables the grower to view previous data documented by the Connect Mobile app. It also allows the operator to download data from the Operations Center to view during the current operation. The grower can access their data directly from the iPad at any time or in any place. Field Review enables the grower to select the field and operation they desire to view. The grower can then select any of the previous map layers to view on the iPad. Field Review provides the grower the ability to perform basic crop scouting activities after the crop has emerged. Growers can utilize this functionality to validate planter performance, check chemical efficacy, or help identify potential agronomic issues that can occur in a field. If the iPad is cellular capable and has an active data plan, Field Review will display the location of the user in the field as they perform their scouting activities.